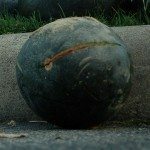 Should I prune my watermelon plant? I would not recommend pruning watermelon plants. Vining fruits and vegetables need the leaves to help convert the sun into energy, which then is used to help develop the fruit. If your watermelon is getting too large for your location, try training it up a trellis. They grow well up trellises, just remember to support the fruit that grows while it is on the trellis. Making a hammock tied to the trellis for the fruit out of old pantyhose or other stretchy material will keep the fruit supported.